Elaine Cotterell, Branch Secretary of Lancashire UNISON; Jo Turton, Chief Executive of Lancashire County Council, and County Councillor Jennifer Mein, Leader of Lancashire County Council. Lancashire County Council is backing a call to improve homecare for older people and people with disabilities. 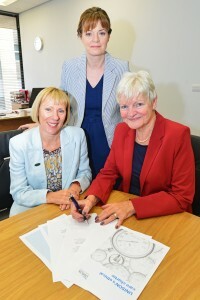 Social care bosses have signed up to UNISON’s Ethical Care Charter. The charter sets out minimum standards for care at home, for the people who receive it and the workers who provide it. The charter states that visits should allow plenty of time for tasks such as help with personal care to be carried out with dignity, and that workers should not have to rush from client to client. It adds that people should have the chance to get to know their homecare worker and wherever possible, should keep the same one. The charter also calls for better conditions for homecare workers themselves, including a living wage, a realistic allowance for travel time and regular, good quality training. Elaine Cotterell, Branch Secretary of Lancashire UNISON, said: “We are delighted that the county council has adopted UNISON’s Ethical Care Charter. “It demonstrates a clear commitment to ensure that staff are properly rewarded and respected for the work they do with vulnerable people in our communities. Jennifer Mein, Leader of Lancashire County Council, said: “We are committed to making sure that people across the county receive the high quality homecare that we would all want for our loved ones – and for ourselves. “This means recognising everyone who receives homecare as an individual person, with his or her own particular needs, together with rewarding homecare workers properly for the vital services they provide every day to thousands of Lancashire people. The county council is currently changing the way it organises homecare. As part of new contracts, the county council is setting the rates it pays for homecare services on the basis that providers will minimise zero hours contracts, pay at least the national minimum wage, currently £6.31 per hour, and move towards paying a living wage (£7.65 per hour).